Michael McFadyen's Scuba Diving - Di's Delight Some of my best dives have come when I have least expected it. Such was my experiences with Di's Delight, a dive site located south-east of Port Moresby in Papua New Guinea. This site, named after Dianne Foster (a local diver), is located south of Loloata Island Resort at Bootless Bay. It is about 12 kilometres from the wharf at Bootless Bay (much less from Loloata) to the site which is inside the barrier reef which extends along the coastline here. The dive site is located at 9° 36' 15"S 147° 18' 53"E (using WGS84 - see my GPS Page about datums). There is a mooring at the site, located just under the surface. The reef here runs east-west and off the southern side of the reef there are a series of bommies. These three bommies are almost one bommie, as they are only separated by small canyons. The bommies are like bricks placed on the bottom, with gaps in between. The western bommie is almost rectangle in shape whereas the other two are triangular in shape, one the reverse of the other. Once you descend the mooring you will find yourself in about 13 metres. This reef section is a bit bare, as if the coral and marine life has been ripped out by big seas. I am not sure if this is correct. The wall drops to over 30 metres. 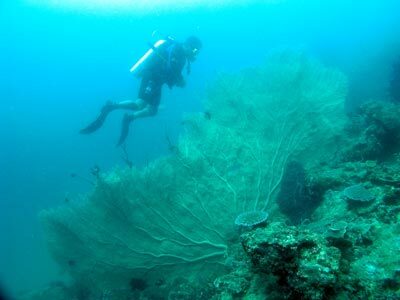 As you swim from the mooring to the bommies you will pass by perhaps the biggest gorgonia sea fan you will ever see. It is huge, at least four metres across. There are some others here, also large, but none like this one. It is as big, if not bigger than the ones I saw in 1992 on a very fast drift dive in Sealark Channel, Honiara, Solomon Islands. Anyway, it is about 20 metres across from the reef to the bommies and in good visibility, you can see the bommies. Once you reach the bommies, swim around them, starting at the bottom. You will be able to dive a very long dive here without going into decompression as long as you gradually ascend throughout the dive. I did over 70 minutes here, including 50 minutes on the bommies. As you go around the bommies you will see that there are even more large gorgonias here. If not for the one that you have already seen, you would rave about these ones. The sides of the bommies have lots of long-finned and short-finned bannerfish as well as moorish idols, diagonal-banded and harlequin sweetlips, pufferfish and all the usual tropical fish. As you come to the first crack between the bommies, you will see that there are some huge gorgonias in the crack. The depth here is 32 metres or so and the sand slopes away even further. In the crack you may also see some of the very large estuary cod that live in this area, I saw at least two around here. You can swim up the crack although I would do it later. Continue around the second of the bommies and soon you will come to another crack. Again, it has some very large gorgonias in it. Both these are great places for photos, with the huge gorgonias and the sun from the northern side giving good silhouettes. Another couple of minutes brings you to the other side of not just the second crack, but a Y intersection where the two cracks both lead off. Swim down the right hand one and you will find some interesting fish clownfish in anemones. Zig zag back to the northern side of the bommie and come right around back to the point where you first met the reef. Keep circling till you have seen all the reef. The western point can have some amazing fishlife, especially when the tides are flowing. On incoming tides the water will come from the south and the fish start building up. First you will see some trevally, then a few small barracudas. Some sweetlips join in, hovering in the current and then large schools of mangrove jacks arrive, swimming into the current and then circling back again. 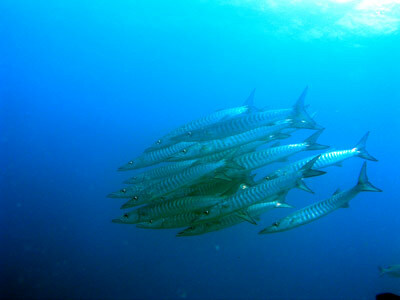 Once the current gets going (it is never too strong), the small barracudas are joined by very large schools of large barracudas. You can get quite close to them. The number of trevally increase and there are some huge humpheaded wrasse swimming in and out of your vision. This is truely spectacular! If you get a bit sick of looking at all these fish, then explore the reef top (depth about 13 metres). 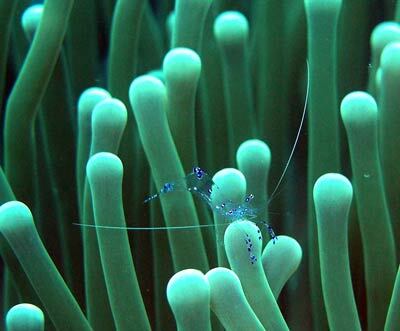 There are quite a few anemones with clownfish and, even more interestingly, transparent shrimp. These are fairly easy to find and make excellent models for photographs. With a digital camera, it is very easy to get good photos. Have another look at the schooling fish before you leave the bommies. Swim back across the gap between the bommies and reef and if you have air and bottom time, explore the reef sides and top. As I indicated earlier, this is a fantastic dive, as good as any I have done anywhere in the Pacific. Visibility was over 30 metres once the tide started (perhaps 15 metres before), water temperature 26.7°C. Again, if you visit Port Moresby or Loloata Island, make sure that you do this dive. I dived here with The Dive Centre which is located in Port Moresby at Ela Beach. It operates the Solatai (built in 1979 for Bob Halstead), a large and slow but comfortable boat capable of carrying well over a dozen divers in comfort. Solatai is based in Bootless Bay, a 15 to 20 minute run to the south-east of the city. The Dive Centre will pick you up in Port Moresby and transport you to Bootless Bay (cost 20 kina return). Double dives, including tanks, weights, refreshments (tea or coffee on arrival and between dives, hot noodles and biscuits between dives) cost 135 kina and a triple dive 190 kina. This represents excellent value, for two dives with transport the cost was 155 kina, equal to A$62. The dive operation is owned by John Miller and his service, as well as that of his employees, Thomas (skipper and dive master) and Ghetto (boatie) was excellent. I can certainly recommend this operation to all divers. You can also dive here using Loloata Island Resort. You can either stay there or stay in Port Moresby and get transported each day (which I understand they will also do).